The Peavey Composer is designed to a 24 3/4" parlor scale with amenities that guitarists of all stripes will appreciate. 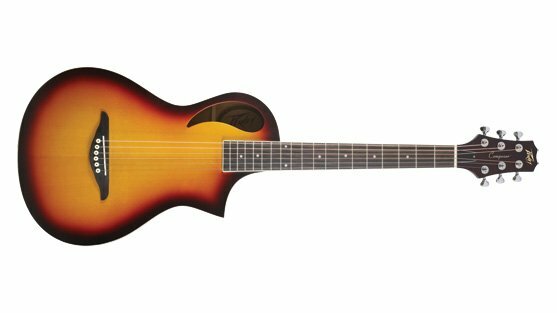 With a spruce laminate top and offset sound hole, the Composer produces a surprising amount of volume for its size, as well as clear, full-bodied acoustic tone and the natural playing comfort of a satin finish. A wide body cutaway scoop to the fifteenth fret provides access to the upper registers of the instrument. Finishing touches such as extensive white binding along the body and neck--and its available natural wood and sunburst satin finishes--give the guitar a classic artisan feel. With its included, back-style gig bag and light weight, the Peavey Composer is a great getaway guitar that makes travel easy and fun for any guitarist.